As well as having to go to the library to look up information in an encyclopedia or physically go to every store to make a purchase, no world wide web would have meant no access to amazing, talented shop owners across the globe. Thankfully, today's technology allows access to the innovative, creative, skilled folks who can take fabric and a sewing machine and turn them into a custom, unique, eye-catching item for kids. Which is exactly what it available from Bum*Cha*Bee Boutique with their whimsical children's clothing and accessories. Specializing in the most adorable pillowcases, dresses, ruffle socks and towels, Bum*Cha*Bee can truly can take the ordinary and make it extraordinary. Whether you are looking for a fashionable birthday gift, a way to brighten up summer, or simply want to add a little style to your little one's life, the personalized, trendy, colorful options at Bum*Cha*Bee Boutique will be sure to bring a smile. As both of my girls have been attending weekly swim lessons and are looking forward to spending much more time at the pool and nearby splash park this summer, I took one look at Bum*Cha*Bee's custom towels and knew without a doubt that they would be a hit. Sure enough, Big Sister E and Little Sister B oohed and aahed over the wide variety of towel colors and patterned fabric options and were nearly jumping for joy at getting to pick their favorites. When, only a very short time later, the completed towels arrived, the excitement was full force. ...and the attention to detail that was put in, we didn't have any doubt that these towels are made to last for quite some time. I know that I don't have to worry that if these are used, washed, used, washed, used and washed many times over the summer, that they are at all at risk of ending up worn or tattered. 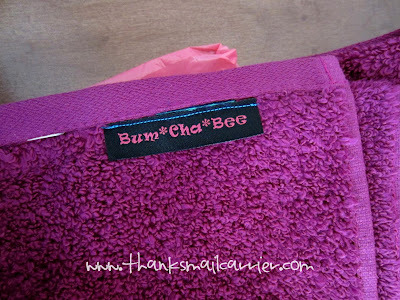 In fact, we have already put our Bum*Cha*Bee Boutique towels to the test many times and the only result has been multiple comments and compliments, along with continued remarks from the girls and I as to just how soft these feel. These really aren't your average cheap bath or beach towels, they feel lavish and extravagant no matter if you are wrapping yourself up right out of the bathtub or are relaxing at the beach! I have no doubt that we will be pulling out our Bum*Cha*Bee Boutique monogrammed towels many more times this summer as well as beyond. 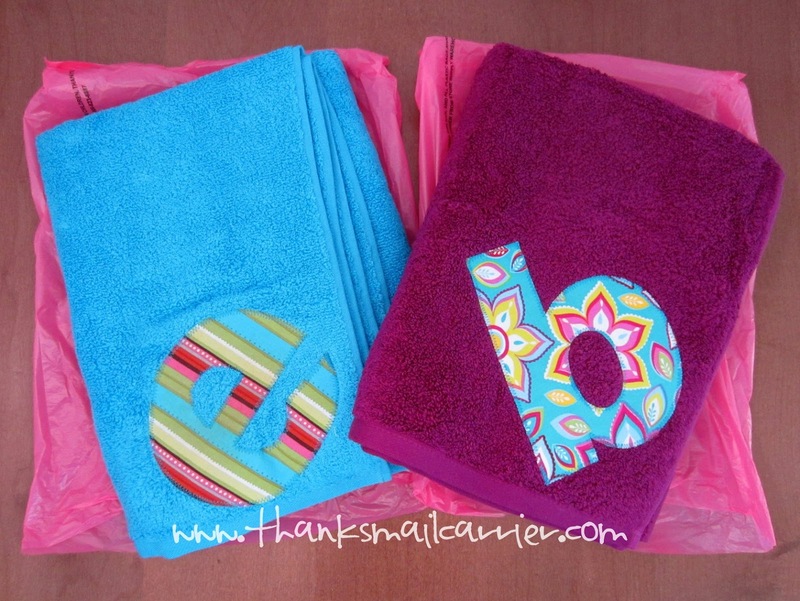 Big Sister E and Little Sister B adore having their own personalized creation and just can't help pointing out their initials over and over as they snuggle into their towels. As these measure in at a generous 30" x 54" I find myself trying to figure out a way to sneak one from the girls for myself so that I can relish in the softness as well! "Hands off our towels, Mom. We know what you're up to." 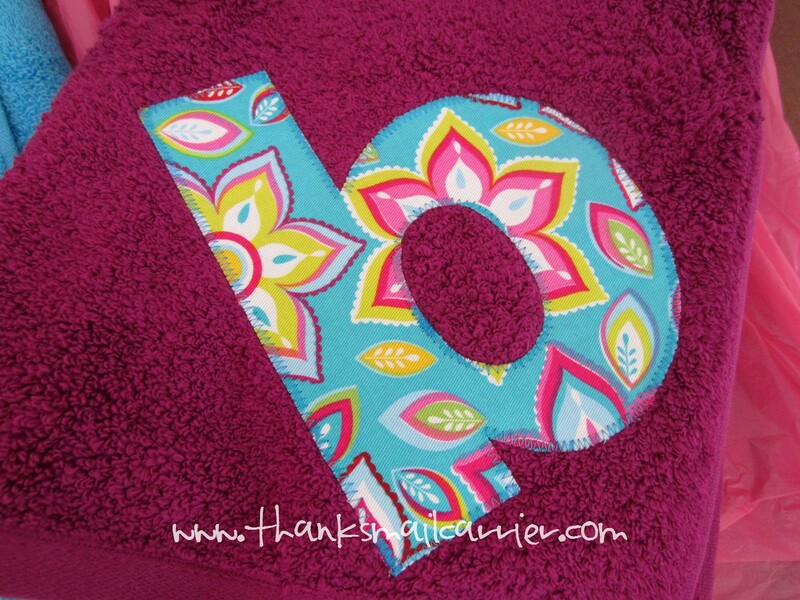 For your next birthday, graduation, baby shower, bridal shower (what a fun twist on the traditional monogrammed towels for newlyweds! ), teacher gift or more, Bum*Cha*Bee Boutique will have a unique, affordable option that you're sure to love. While the ruffle socks and dresses contain the wow factor for the girls, the towels and pillowcases have plenty of options that will be a hit with boys as well. In fact, Bum*Cha*Bee offers such a wide variety of fabrics that all you have to do is ask and they will most likely have just what you have in mind! With prices retailing from $5 for ruffle socks, $15 for custom pillowcases or towels, and $21 - $25 for adorable dresses, once you have visited this stylish Etsy shop, you'll want to return again and again for all of your upcoming gifts! One lucky person will win their choice of custom, personalized item from Bum*Cha*Bee Boutique! 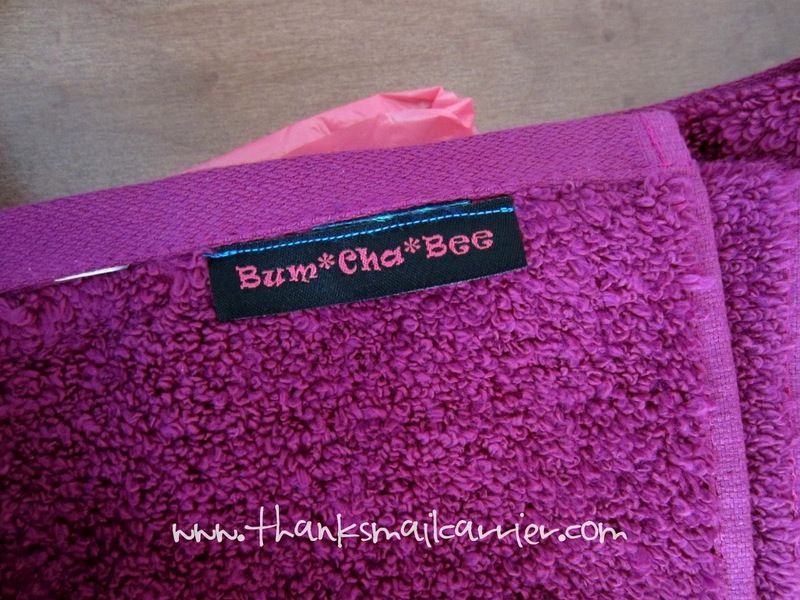 A big thank you to Bum*Cha*Bee Boutique for providing two custom towels for me to review as well as the item of choice for one lucky giveaway winner. The opinions shared are my own and honest and if you really need to see more, click here to see how I roll. The ruffle socks are adorable! My fave has to be the towels, though. I love the custom letter towels. The pillowcases are super cute too! 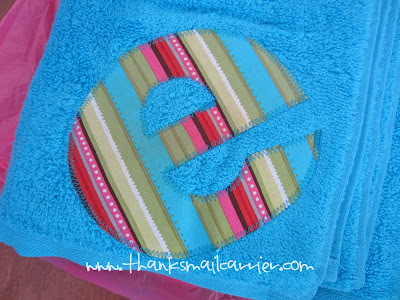 I like the Custom Beach, Pool or Bath Towel with Any Initial. I love the custom letter towels, so cute. I love the princess pillowcase. How cute ! I really like the Custom Beach Towels, in the bright colors! the ruffled socks! The baseball ones, perhaps! I know two tiny little girly fans. Love the print fabric dress. My fav item was the custom beach towel. My niece needs the custom Damask dress! Custom Beach Towel for me! I like the Custom Beach, Pool or Bath Towel. I like the princess pillow case. Oh I love the beach towels. We are going to the beach so often with our kids, but they don't have their own towels. This would be great and no arguing over which belongs to whom. It's a toss-up between two things: pretty edging on socks and the initals in prints on towels. the I love dance pillowcase is my favorite! I love the Custom Damask Print Fabric Initial Dress - Black. Thanks for the chance to win! I love the adorable zebra stacked cross dress. Thanks for hosting! I love the Custom Beach, Pool or Bath Towel with Initials. I'd get one in different colors for each of our three kids. I love both the pillowcases and towels! The custom towels look really unique and cute. I like the fun colors of the Custom Beach, Pool or Bath Towel. I like the custom beach towel. I like the girls baseball ruffle socks. i love the Custom Damask Print Fabric Initial Dress - Black! I love the cowboy pillow case! I love the Custom Damask Print Fabric Initial Dress In Hot Pink! The I Love Dance Pillowcase is my favorite. I'd choose a bath towel to give my niece who's going off to college this fall. Cute! definitely the towels!! Love them!! I like the cowboy pillowcase. I like the custom towels in purple and pink. I like the custom Initial Dress. I like the Princess Pillowcase - Standard Size. I love the ruffle socks. My favorite item is Custom Damask Print Fabric Initial Dress - Black. Thanks so much! Too cute, I have a few cowgirls too! I love the custom towels and ruffled socks. Goodness...I like everything you have...but since I have to pick...Id say that precious little damask print fabric initial dress...in the black! Very precious items you have! I like the I love Dance pillow case. I like the Princess pillowcase. The Custom Beach, Pool, or Bath Towel looks very nice! 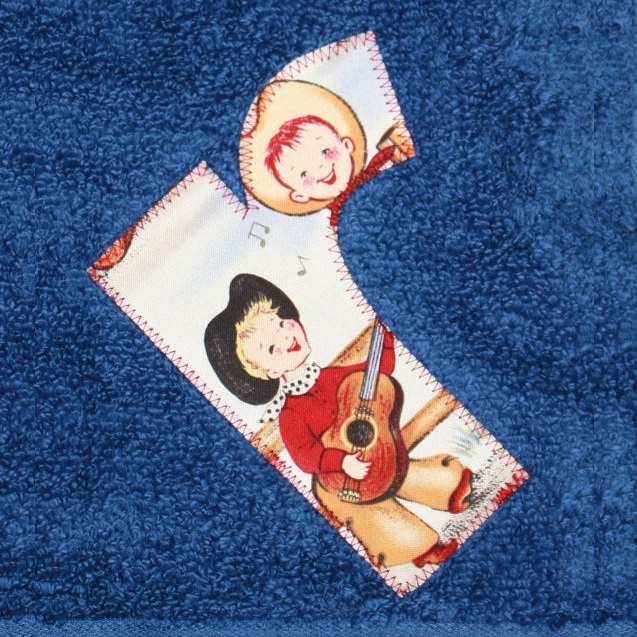 I like the Lil' Cow Poke Cowboy Custom Initial Bath or Beach Towel. Thanks! The zebra stacked cross dress is cute! I love your towels you got! So cute. My fave from her site is the Custom Damask Print Fabric Initial Dress in pink. I like the Adorable Zebra Stacked Cross Dress. the towels are so pretty! I really like the towels. So colorful.